Nothing quite says Jersey, food-wise, like pork roll (or Taylor ham, as it’s known in North Jersey): a lightly smoked and cured pork product, akin to Canadian bacon. 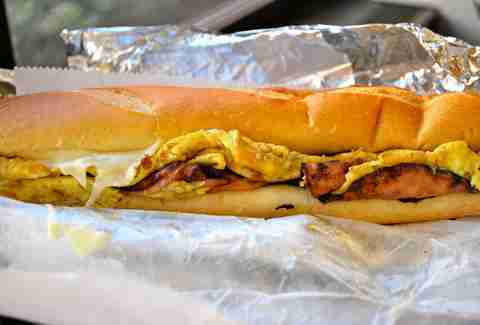 A pork roll, egg, and cheese is the unofficial state sandwich. The obsession goes so far, there are even two festivals in Trenton devoted to pork roll (there was a third, devoted to veggie pork roll, but that didn’t last long). While South and North Jerseyans may disagree on its name, everyone in the state can agree on one thing: a Taylor ham/pork roll, egg, and cheese reigns supreme for breakfast. These are the 13 best places to get Jersey’s most iconic sandwich (in each case, we’ve used “Taylor ham’’ or “pork roll,” depending on what each place calls it). If an out-of-stater asks which Jersey diner they absolutely have to go to, the answer is always the Summit Diner: a barrel-roofed, wooden-boothed wonder in the center of town. The grill is right up front, and you can see and smell your food cooking. While in most places, “sliders’’ are miniature burgers, here they’re Taylor ham, egg, and cheese sandwiches, with plenty of grease and cheese oozing from the hard roll. 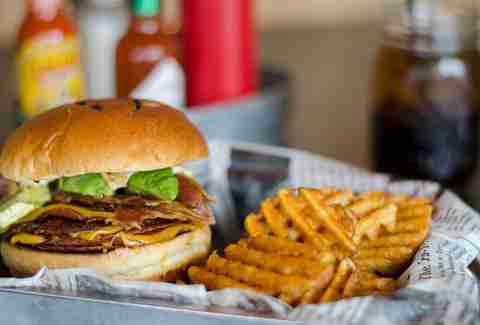 The Pig makes excellent burgers, but don’t let that distract you from its pork roll sandwiches. At $12-$15, they’re a bit pricer than others in the state, but they’re loaded enough to make it well worth your money. The appropriately named Kitchen Sinker packs extra pork roll, extra American cheese, plus fried egg, bacon, and avocado into a nicely toasted brioche bun (be sure to order the sweet potato fries as your included side). Don’t be thrown off by the hodgepodge of antiques, signs, magazines, and assorted stuff for sale (1940 dentist’s drill, anyone? 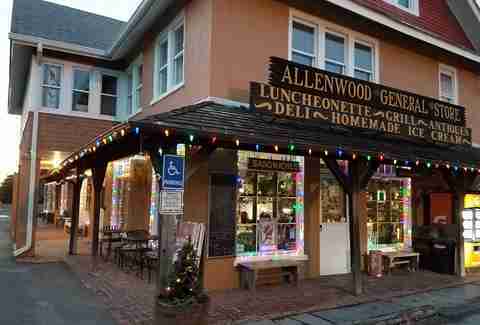 ); the Allenwood General Store is very much a breakfast spot, and it goes through pork roll like diners go through coffee. Check out the massive 6-pound logs of pork roll in the display case, then sit down and see if the self-proclaimed “world’s best pork roll sandwich’’ lives up to its name. It’s certainly one of the state’s best, with perfectly grilled thin slices on a Kaiser roll. Near the top of the state is this barebones strip-mall deli, owned by the same people as Kathy’s Restaurant and the Fredon Dairy next door. Sussex County is known for its farms, which is why the sandwich here features some of the freshest-tasting eggs you’ll find on a Taylor ham/pork roll sandwich. 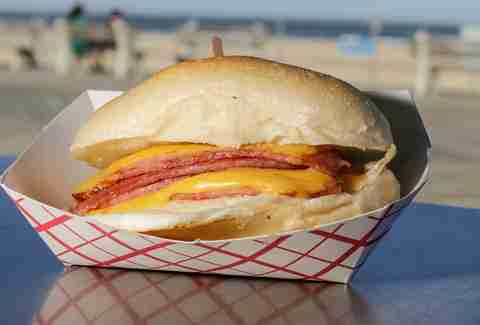 At its boardwalk stand in Asbury Park and a storefront in Belmar, Hoagitos offers creative twists on classic sandwiches, so it’s no surprise its egg and cheese, with choice of pork roll, bacon, or sausage, is a standout. It’s all about the bread here -- chewy, first-rate rolls with just the right amount of give. There’s plenty to love about this Toms River diner, from the name, to the kitschy decor (signs, license plates, Hula-Hoops, sleds), to the fact that the waitresses wear pajamas. But beyond all that, it’s also home to some of the state’s heartiest country breakfasts. You can get a regular pork roll sandwich here, but you’ll want to go for the heavy-loaded Shut Up and Eat! 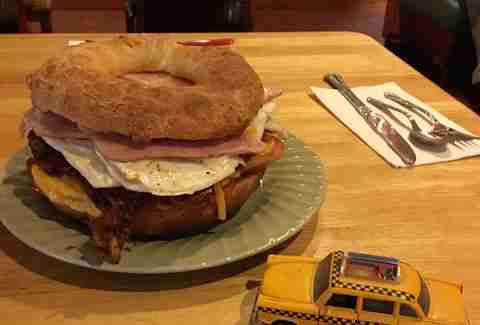 sandwich: bacon, pork roll, sausage, ham, egg, and cheese on a hard roll with a side of potatoes. Jerseyans love their Taylor ham/pork roll on a bagel almost as much as on a hard roll. For the best take on the bagel variety, head to Bagel Chateau, which goes through 100-plus pounds of Taylor ham every week. 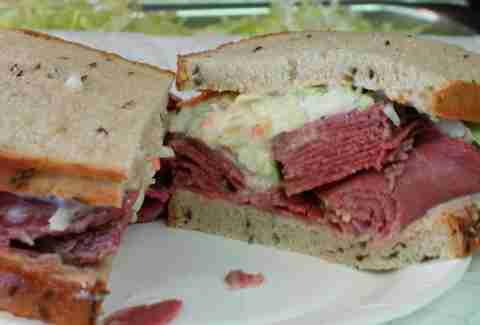 The sandwich here features thinly sliced and crispy meat and plenty of gooey cheese. If you're the type who thinks a Taylor ham/pork roll sandwich belongs only on a roll, you’re about to have your breakfast-meat world upended. Johnny Yarusi, owner of the Johnny's Pork Roll truck, may be the state's most enthusiastic pork roll ambassador. "Like everybody in Jersey, I grew up eating pork roll,'' Yarusi told host David Infante in a Thrillist Food/Groups video. "It's who we are.'' Here, you'll find the usual pork roll, egg, and cheese on a hard roll, but there’s also a bevy of over-the-top twists, like the Hawaiian (pork roll, pineapple, Swiss, Sriracha), the Western (pork roll, provolone, sautéed peppers, and onions). Not to be confused with the White Rose System in nearby Roselle, the White Rose is a classic ‘60s diner in an industrial section of Linden Menu where menu items are written on multi-colored construction paper, and you can always find owner Rich Belfer behind the grill. 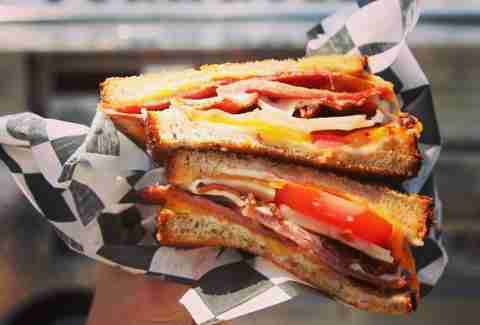 The meat used here is Goodie pork roll, made by the OG Taylor ham producers. It's cut thin, and served on a soft Kaiser roll. A Jersey Shore landmark, Frank's is not much to look at -- faded blue facade, time-worn booths, and stools in a luncheonette atmosphere -- but it packs in crowds on the weekends, mainly for its pork roll sandwich, which may be the state's biggest: a fat, meaty behemoth that’s likely to make lunch -- and dinner -- an afterthought. Don't be fooled by the spare, spartan surroundings; this small-town deli serves up a terrific Taylor ham sandwich, using Thumann's Jersey Made pork roll (which the owner considers less greasy than traditional Taylor ham). The meat gets grilled until perfectly crispy and topped with fresh eggs and cheese on a crusty roll. Visit Slater's web site, and the first thing you'll see is a pork roll sandwich -- that’s because it’s the menu item it’s been known for since day one. The sandwiches here are seriously stuffed, with thick slices of meat, yolky eggs, and cheese dripping off like molten yellow lava. 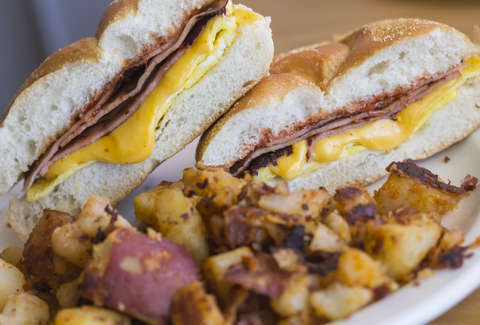 While you’ll find pork roll on the menu at just about every diner the state, the one at Crossroads, at the junction of Routes 46 and 519, stands out simply for how hefty it is. Pop some quarters in the jukebox (everyone from Adam Ant to George Strait) and enjoy the great retro atmosphere with Jersey's version of the breakfast of champions. Peter Genovese is a food writer for nj.com and the author of 10 books, including Jersey Diners and Pizza City: The Ultimate Guide to New York’s Favorite Food. Follow him on Twitter and Instagram.